I got my copy of Nintendogs today! I started it and chose a dog from the kennel, I went with a miniature dachshund since Chips my old dog who past away was a dachshund. I also called my puppy Bugles since my old dog was called Chips and my favorite chips is Bugles. Its such a cool simulation, Bugles recognizes its name and I can teach it tricks. So far I thought him how to sit and lie down so when I say Bugles sit, he sits. 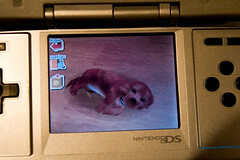 Nintendogs is basically like a Tagamotchi pet except its far way more advanced. Did you hear? Nintendo's working on Nintencats! If there's going to be a sequel, I say make it online capable.